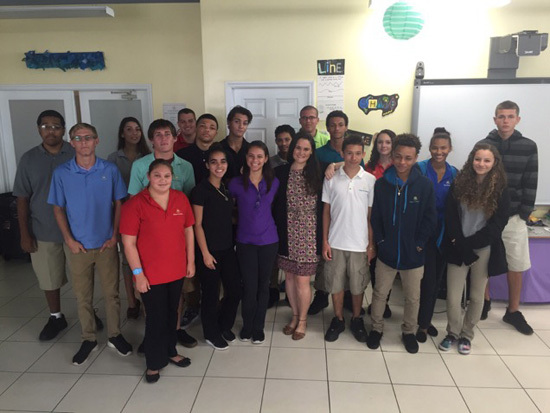 George Town, 17 March 2016 — YCLA recipient Kellie McGee-Sandy is actively fulfilling her mission as a role model and mentor for the youth of Cayman. Since receiving her award last November, Kellie has addressed more than 6,800 people in Grand Cayman alone, and has reached countless others in all three islands via radio and TV. She is currently preparing to make a trip to Cayman Brac to address school children there. Young audiences are clearly inspired by Kellie’s message. In addition to her many media appearances and school talks, Kellie was chosen as Keynote speaker for the recent luncheon held by Mentoring Cayman, a youth development initiative jointly supported by the Cayman Islands Chamber of Commerce and the Ministry of Education, Training and Employment. Kellie completed the same programme 12 years ago, and in her remarks emphasized the importance of mentoring through several examples from her own personal story. Kellie will be flying off to Cayman Brac on March 21 to meet with and address school children there. The YCLA extends special thanks to its Sponsors . These committed organisations make the porgramme possible. Major sponsors are Dart and PricewaterhouseCoopers; Other loyal sponsors are: CNB; KPMG; Pinnacle Media; Progressive Distributors; Baraud International; Scotiabank; Celebrations; The Ritz Carlton; and the Tibbetts Family Foundation (JEM). Celebrating its 16th Anniversary this year, the Young Caymanian Leadership Awards programme has as its mission to identify, celebrate and honour outstanding young leaders in the community who, through their actions, behaviour and leadership, serve as role models for the youth of Cayman.